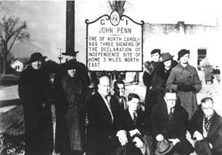 nyone is free to submit a proposal for a highway historical marker. Primary and secondary research should be included to support the validity of the claim or authenticity of the site. Proposals must be received by April 1 or by November 1, in advance of the May and December advisory committee meetings. Once received, the staff of the Research Branch will attempt to verify and supplement the proposal. The best possible case will be made in the presentation to the committee. The administrator of the program makes the applications available to the committee electronically, so a digital application is preferred (but not required). Files on all proposals are maintained by the Research Branch and are available for public examination upon request.